Zelaya on Roberto Micheletti: "I want to see what this coup planner has to say"
(CNN) -- Deposed Honduran President Jose Manuel Zelaya arrived Wednesday in Costa Rica a day ahead of planned discussions with the man who ousted him and the host country's president. and He vowed he has no plans to negotiate. Jose Manuel Zelaya was ousted as president of Honduras on June 28. "I want to clarify that our presence here does not represent any negotiation," he told reporters at the airport in San Jose. "It's simply listening through a mediator ... to the approach of those who have established this regimen of fact, those who kicked out their servant and brought him here by force at dawn on the 28th of June of 2009, to see how they are planning their departure." Zelaya arrived on a flight from Washington, where he had met with a representative of the U.S. State Department, which has backed his demand to be returned to power. "We hope that in the next 24 hours, sometime tomorrow, we will have a very clear response from the coup members," he said. Zelaya bristled over the suggestion that he might consider negotiating with provisional President Roberto Micheletti, the former congressional leader and now the newly installed president. "It's as if you were to invite to your place a criminal who raped your family and wanted you to accept conditions for that violation," said Zelaya, whose term in office was to end in January. "Democracy is a popular right. It is a right of the society." Zelaya said Micheletti "should logically present his excuses and his requirements for his departure in the next 24 hours." He added, "The people of the world have condemned him, including Costa Rica. I want to see what this coup planner has to say tomorrow in San Jose." The conference is being hosted at the home of Oscar Arias, a winner of the Nobel Peace Prize and the president of Costa Rica. That nation has no army. In Tegucigalpa, the capital of Honduras, Micheletti said he had not decided whether to go himself or to simply send his representatives. "We're still consulting whether to go," he told reporters. "We'll wait." Arias acknowledged the clashing views, but expressed optimism. "They are distant, different positions," he told reporters in San Jose. "But we are going to begin and that softens positions. In every dialogue, one gives. To do that is to get closer." In San Jose, Organization of American States Secretary General Jose Miguel Insulza said he is open to discussion on some issues, but not all. "Let's talk about everything," he told CNN en Español. "But the legality of the coup on Sunday? You can't discuss that." Insulza visited Tegucigalpa last week in a failed bid to persuade Micheletti and his supporters to relent and allow Zelaya to return to his post. He said he did not understand why a detention order issued for Zelaya had not simply been carried out. "What nobody explained to me is why, with an order of detention, they threw him out of the country," he said. But Insulza expressed hope that the impasse will be resolved. "I hope that the mediation tomorrow works," he said. "But what cannot work is an attitude completely from the past like a coup d'état that kicks a president out of the country. That cannot happen." In Tegucigalpa, Gen. Romeo Vasquez Velazquez, the leader of the Honduran armed forces, said "a consensual decision among institutions" had been made to expel Zelaya. "If he had been taken to prison, the people may have tried to take him out," he said. "There could have been a quantity of deaths." Also Wednesday, Human Rights Watch issued a statement saying that evidence suggests that Honduran soldiers "may have used excessive force" against Zelaya supporters who had assembled Sunday at the airport in Tegucigalpa to demonstrate in his favor. At least one teenage boy was killed. "The evidence we've seen suggests that soldiers shot at unarmed demonstrators," said Jose Miguel Vivanco, Americas director at Human Rights Watch. "Because someone is dead, the de facto government is obliged to make sure an independent investigation is carried out instead of issuing blanket denials." "One witness stated that he observed at least two soldiers come through the fence and shoot their weapons into the crowd, at the level at which the people were running," the statement said. "The other reported that he observed a soldier deliberately and methodically aiming and shooting his rifle at demonstrators in the crowd." Human Rights Watch said visual evidence suggested that some soldiers were using live ammunition, not rubber bullets. "Images of brass casings left behind by the soldiers after the shooting also show that the casings were not crimped, as would ordinarily be the case with blanks, which would denote the use of rubber bullets. Because even rubber bullets can prove lethal, international standards require that they be used only in self-defense or defense of others against the imminent threat of death or serious injury, the advocacy group said. "In this case, despite the rock-throwing, there would appear to have been no adequate justification for shooting rubber bullets into the crowd." But Vasquez rejected the Human Rights Watch report, calling it "disinformation." The soldiers instead were firing rubber bullets and tear gas, Vasquez said. Though he acknowledged that a fatality occurred, he said each soldier carries a book of rules that state clearly they are not allowed to fire at people who are not armed. "I want to tell you and the world that it's necessary to leave this to the organs of the state that are investigating," he said. Daniel Zovatto, an analyst with the San Jose, California-based International Institute for Democracy and Electoral Assistance, said Zelaya would have to agree to some conditions if he hopes to return to power. "The return of President Zelaya would have to come from an amnesty on the part of the Congress and, in second place, from the promise by Zelaya not to run for re-election," he said. 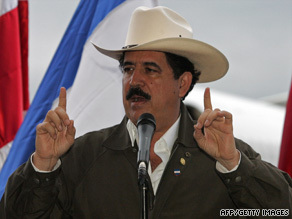 Zelaya, a leftist who took office in 2006 on a narrow victory, had been at odds with Honduran lawmakers, the supreme court and the military over a referendum he had planned to hold last month. Congress had forbidden it, and the supreme court ruled it illegal. Zelaya sought the referendum to see whether voters wanted a measure on November's ballot to establish a constitutional assembly to study whether a president could run for re-election. Under the current charter, a president can only serve one four-year term. Venezuelan President Hugo Chavez, a Zelaya ally, won a similar referendum this year, and many Hondurans thought Zelaya was trying to maneuver a way to seek re-election in November. He has denied the assertion. After 18 years of nearly uninterrupted military rule, Honduras returned to civilian control in 1981. Since then, the military had not seemed interested in holding power in the nation of more than 7 million people, about 70 percent of whom live in poverty. Military interventions were once common in Latin America, but civilian governments have held sway since the 1980s. Before Honduras' incident, the only other barracks revolt this decade was an unsuccessful 2002 coup attempt against Chavez, when the military displaced him but backed down days later and allowed his reinstatement.